The current and second paddle-steamer to bear the name "Waverley" was built by A & J Inglis, Glasgow, 1946. She replaced her predecessor of 1866, lost in the 1940 Dunkirk evacuation. The final paddle steamer built for Clyde service, Waverley now enjoys the unique distinction of being the world's last sea-going paddle steamer. Bought by the Paddle Steamer Preservation Society (PSPS) for one Pound in 1974, the old steamer was granted new life by mainly volunteer enthusiasts who have rejuvenated, maintained and operated her over ensuing decades. A major programme of refurbishment and rebuilding between 2000-03 largely restored Waverley to her original 1947 glory. Sailing itineraries see Waverley regularly venturing far beyond Clyde waters. She is equally at home cruising Scotland's west coast, the River Thames and England's south coast. Adventures have also included an historic circumnavigation of Great Britain and visits to French and Eire coasts. Waverley continues to earn her place as a much-loved national treasure and iconic symbol of Britain's special maritime heritage. 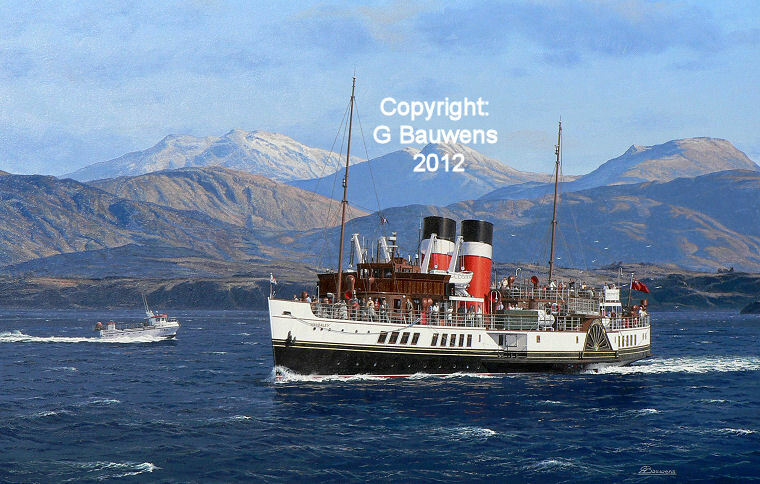 This lively portrait of PS Waverley during a cruise out of Oban on Scotland's scenic west coast, features all the characteristics by which Gordon Bauwens' paintings are renowned. The high quality signed prints will especially attract all whose spirits, like the artist, are lifted by such classic ships set against backgrounds of great natural beauty. 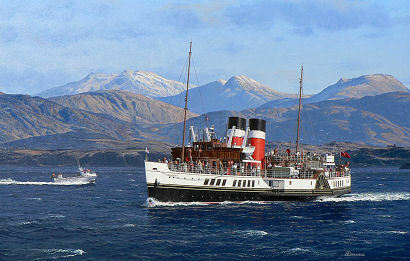 From an original oil painting by Gordon Bauwens of the world’s last seagoing paddle steamer in the Sound of Mull.